Dr. Christman is a highly enthusiastic and energetic professional with a deep passion for learning and acquiring additional clinical experience in the fields of periodontics and prosthodontics. Dr. Christman received his Bachelor of Science from University of Minnesota in 2000, and his Doctorate of Dental Medicine from Temple University School of Dentistry in 2005. Following completion of his dental degree, Dr. Christman served as an officer (Lieutenant Commander) in the US Navy at posts both state-side and overseas where he helped safeguard military readiness by providing service members and their families with high-quality dental care. In 2009, upon completion of his military service, Dr. Christman pursued advanced training in periodontics and implants through a three-year surgical residency at Nova Southeastern College of Dental Medicine in Fort Lauderdale, Florida (2009-2012). After completing his Board Certification as a Periodontist, Dr. Christman furthered his skills through a one-year Implant Periodontal Prosthodontics Fellowship at the University Of Maryland School Of Dentistry in 2013. Through this intensive program, he increased his clinical and technical abilities to deliver the highest quality of advanced patient care in Periodontal and implant dentistry. 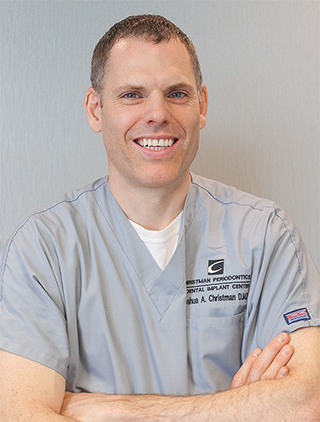 On a personal note, Dr. Christman resides in Lancaster, PA with his wife and three children. He brings his enthusiasm home to his family through their love of travel, cooking, and outdoor activities of all kinds. Dr. Christman is an ex-collegiate runner and enjoys participating in a variety of sports including triathlons, mountain biking and skiing.